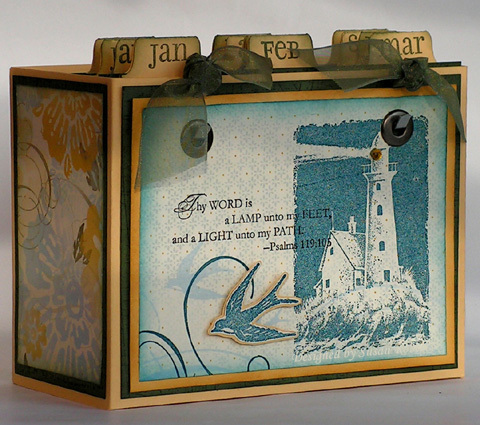 Lori Craig has organized a Bible Verse Challenge over on Splitcoaststampers. “We’ll each create an on-going altered journal, rolodex card, scrapbook page, ATC or recipe card project… Each month we will choose a verse and get to stamping. We’ll add that piece to our collection.” Here is my first scripture card, the storage box and dividers. Isn’t this a wonderful idea and challenge! I am just now joining in for the month of April. I plan to make this more than just a year long project.. perhaps a life long project. The scripture card hangs from the picture hooks in plain view all month. As I create the next month’s card, I will simply take the old one off from the hooks and file it under the month in which I created and memorized it. It will be easily available if I choose to refer back. Oh and another easy change each month could be the ribbon around the hangers. Thank you, Lori, for such a meaningful and awesome challenge!! The finished box measures 5-3/4″ wide X 4-1/2″ tall X 3″ deep. Each scripture card measures 4″ X 5-1/4″. The center of the holes for the eyelets on the scripture card are 5/8″ from the top and 1″ from the side of the card. The holes for the brads are placed 1/8″ from the top and 1-1/4″ from the side fold on the box. 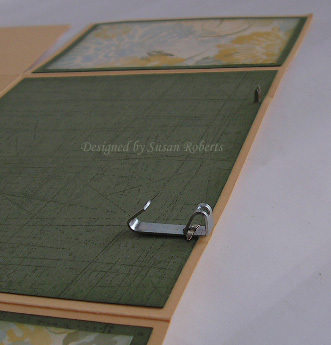 These are just the regular inexpensive picture hangers that measure 7/8″ in length. The holes for the brads are placed 1/8″ from the top and 1-1/4″ from the side fold. 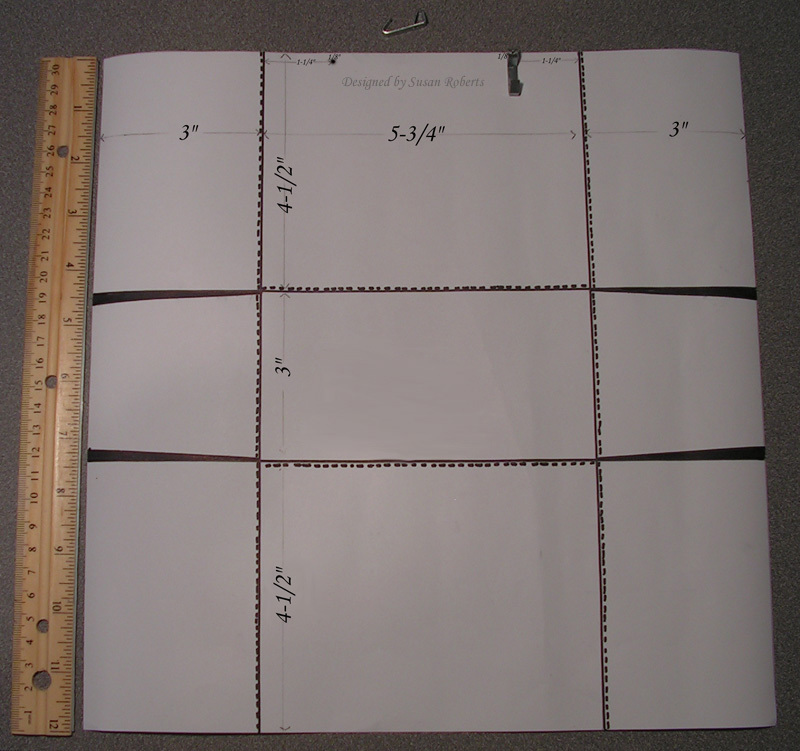 Each divider card measure 4-1/2″ X 5-1/2″ not including the tab. This is so gorgeous, Susan! I truly love the tutorial you made, too. The colors are perfect – I love that “heavenly” patterned paper! TFS! What a wonderful idea. I’ve been going to join this challenge for quite a while and maybe this will inspire me to get going on it. I love your box design. Must cASE! Thanks. How clever! I have been trying to figure out for a month how I want to hang mine, and you did it so quickly! LOL. Great idea! this is beautiful, I love that stamp set. This is a wonderful way to have the verse visible all month and to store the scripture cards! Just beautiful, Susan! Great tutorial. Great idea! You do such an amazing job on everything! I just received your email, I had sent you an email twice with my address do you think that it is going to your junk email. Please, please, plaease I love that set and would hate to loose it, since I was so excited to win it. My address, if you could pelase delete this comment after reading it. This is gorgeous and something to be treasured for years to come! This is a great idea – and it would be the perfect RS super Saturday gift to make….if you’re really nice to me I won’t suggest it though! Glad you made it home – no cards in Mexico? I was waiting to see if you posted anything from PV with cards – but I guess you were too busy floating in the pool. I’m waiting for the baby – very impatiently I might add – but she’ll be induced on Monday so I’ve only got to get myself through the weekend! I love your mom’s cards – they are beautiful – are you going to do something with them? Frame them? The 3 of them framed together would be beautiful! Time to eat…then shop…that’s all I’ve done for the last week! I’m gaining “baby weight” right along with Lyndsey – but at least I have new shoes! wow, this is gorgeous! I love the picture hangers on the front, fabulous idea for having the scripture verse in front for the month, actaully a great devotional tool. I may just have to case this idea! Thanks so much for showing how you made it. Oh Susan! This is fabulous looking and I just love those papers and colors! Such a great idea the way you decided to hook them to the front! Happy Stamping Hugs! wow! 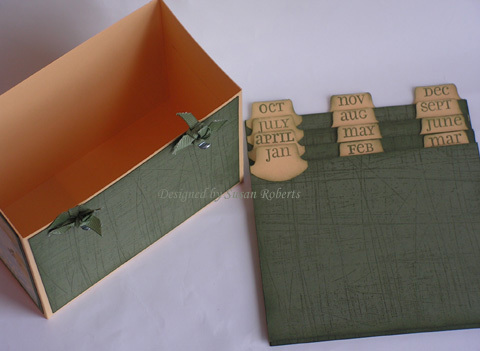 this a FABULOUS, what a fantastic use of this set and a great idea to make it a lifelong project – you will be BLESSED! Susan, this is beautiful!! I’ve been playing with this idea, just hadn’t quite come up with a template for the box. Thank you for sharing it with us!! Now I don’t have an excuse!! This is a fabulous idea and you made it so beautifully!!! No surprise. I love your color schemes and paterns! That is so funny that Nan suggested a RS class because that is exactly what I was thinking and I will ask!!!!! 😀 heeeheee Maybe for September? This is just beautiful!!! I love the colors you used, so peaceful! Susan, this is a beautiful project! What a wonderful idea. I think my Mom and Grandmother would love something like this too! Your box and first Scripture page are fabulous! Absolutely gorgeous! Thank you for sharing this project and for your wonderful tutorial! So glad you jumped in Susan! Love your display box idea – so clever and practical! This is stunning! What a great idea. I love how you stamped the front image right on the LeJardin paper. Gorgeously inspirational. TFS! This is so creative! I love it Susan, the photo hanger idea is ingenious! I love the verse you chose for this card, a very beautiful project. Susan, this is so inspirational and beautiful…love it! What a wonderful idea! Thanks for sharing both your finished piece and the tutorial! That is really beautiful!…and thanks so much for the tutorial on how to make the box! I love the idea of doing this Scripture challenge each month, though I’ve yet to find time to start. Someday…. Fabulous Susan! I’ve got the challenge sitting on my stamp table; just haven’t done anything with it yet. This is so beautiful, and a perfect way to keep your monthly verse challenges all together! I love it, Susan!! Wow! What a cool idea. May be I can make this organize my CS. This is incredibly fabulous!!! I LOVE the picture hooks and the idea to hang each month’s project — totally FABULOUS!!! This is beautiful, Susan! Using the picture hooks is a brilliant idea!!! Just lovely!! WOW … this is just so fantastic … I can’t wait to make this little box. WOW…this is beautiful, such a great gift idea. Thanks so much for sharing. You are such and inspiration, glad I found your blog. I be sure to visit regularly now. I’m so glad my friend shared this with me. Not only have I found a new project, I’ve found a new blog! Will be checking in regularly! Keep ’em coming! 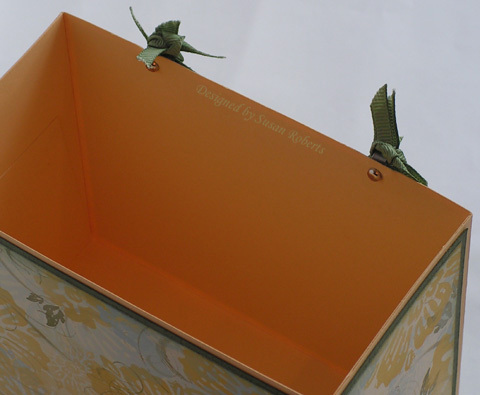 Love the design of this box for hanging and storing your verses – thanks for sharing the instructions! Super template for retreat destination packing of craft materials and embellishments. Small hanger, brads, and bookplate for owner id provide heavy metal to balance display/treasure storage supplying total attention and eye candy of Bible scripture to be hidden in the heart. Grace and peace be unto you treasuring dot and tittle, all powerful Word.